I can't believe that I'm staying up this late just to finish this korean romantic-comedy TV series. I've been hearing a good feeback so I decided to watch it for myself and boy, I was not disappointed at all. maybe it helps that I'm still a teenager at hear (wink!). I haven't watched yet the original series which is the Taiwanese version (It Started with a Kiss). I'm going to watch it later or tomorrow so I can compare the difference between the two. The male lead on the Taiwanese version is gorgeous as well. Sigh! Moral lesson of the story - "Love Conquers All" and “Try and fail, but don't fail to try.” It's a heart warming and inspirational story for people who doesn't believe in all the impossibles in life. 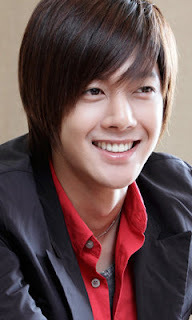 Who would've thought that I'm starting to like the actor Kim Hyun Joong just by watching this series. I admit it, he has this charming smile that will make you swoon! Tsk! How come Korean actors nowdays can be so hunky and gorgeous? (my first crush will still be Jang Geun Suk though). I'm still in Cloud 9 after watching this TV series. Too bad it doesn't have a second season like the Taiwanese version though I read on the internet that they have 7 episodes in YouTube for the Playful Kiss: Special Edition. I thought within the 16 episoded that Oh Ha Ni will be pregnant. Yeah, my imagination is getting ahead of me. I guess I will have to settle for the special episodes and hopefully (I'm crossing my fingers), they will start considering to have a Season 2. Hello Kitts! I've watched the YT Specials :) After watching all of it parang nassway na ko para maging KHJ at gagawin ko na lang second si JGS...hehehe. Too bad I was not able to see KHJ in person since I'm still over the moon with JGS.